Is DR Congo's New President On a Leash? DRC Poll Reactions - a Sign of Better Standards - or Double Standards? What's the Way Forward for DR Congo? Felix Tshisekedi Has Officially Won, But Can he Govern? 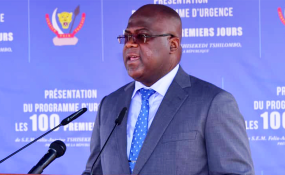 The United Nations' top official in the Democratic Republic of Congo has urged President Felix Tshisekedi to form a new government without delay, as the country continues its first peaceful transition of power in its nearly 60 years as an independent nation. The U.N. has its largest peacekeeping mission in the DRC — more than 17,000 troops and police, plus 4,000 civilian personnel with a budget of more than $1 billion a year. The mission's main priority is the protection of civilians, mainly in the country's volatile east, where dozens of armed groups threaten the population. The U.N. is looking to gradually drawdown and ultimately close the mission, and has begun to plan for its exit. The U.N. Security Council will reauthorize the mission later this month and is currently discussing its mandate — which is likely to include a refocusing of the mission on the eastern part of the country to areas where threats are highest — and the reconfiguration of some military units into rapid deployment forces. Copyright © 2019 Voice of America. All rights reserved. Distributed by AllAfrica Global Media (allAfrica.com). To contact the copyright holder directly for corrections — or for permission to republish or make other authorized use of this material, click here.